Let's Agree to Never Make Meatgrinders Sentient, OK? There are more detailed shots below, in the gallery, but do not blame me if you vomit. A meat grinder or meat mincer is a kitchen appliance for grinding, fine mincing or mixing raw or cooked meat, fish, vegetables or similar food. It replaces tools like the mincing knife, for example, which has been used to produce minced meat, filling etc. The producer puts the minced food into a funnel, which is placed on the top of the grinder. From there the material goes on a horizontal screw conveyor. This screw conveyor, that can be powered by a hand wheel or an electric motor, squashes and partially mixes the food. At the end of the screw conveyor there is a knife installed directly in front of the fixed hole plate. 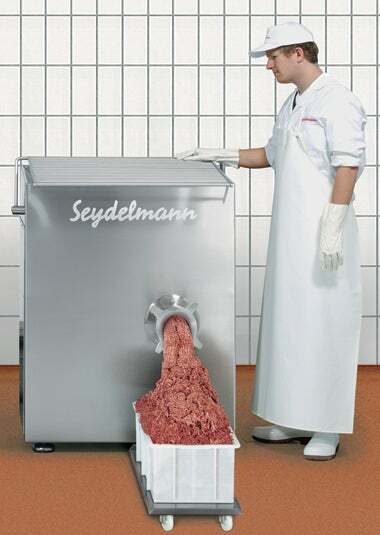 At this opening the minced meat comes out of the machine. The fineness of the meat depends on the size of the holes of the plate. Four out of Five Gizmodo editors didn't have the stomach to post this. I can't say I blame them.